This twodie set is intended for reloading bottleneck cases and consists of a FullLength Sizer Die with an ExpanderDecapping Unit and a Seater Die with Bullet Seater Plug. The FullLength Sizer Die brings the case to SAAMI minimum cartridge dimensions. It sizes the outside of the case deprimes and expands the neck to accept the bullet. The die has vents to prevent case damage caused by trapped air and for excessive lubricant. Headspace is held to minimum tolerances to avoid changing the case body length during full length sizing. 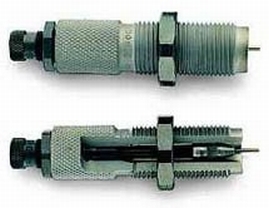 The included Seater Die has a builtin roll crimper to secure the bullet at the same time as its seated.